I am a gardener and wreath maker. I live 'off grid', moving between our family home in Mid Wales and my camp in ancient woodland in Kent. I grow flowers, shrubs, trees, etc. to sell....and for the love of it! It is very important to me to grow both food and ornamental plants without pesticides, insecticides, or artificial fertilisers. Let's save the bees! My work is inspired by natural beauty – especially the unique Kent chalk heaths, rolling Welsh hills and the Carpathian Mountains. 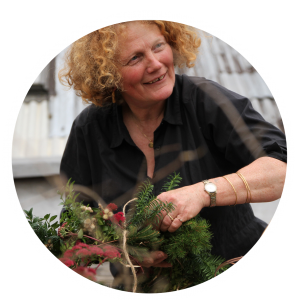 Many of the materials used in my work are foraged from these environments – my own gardens and the hedgerows, meadows and woods that I get to know during my travels.Unlike traditional florists, I forage, grow and gather many of the materials myself. I sell my flowers, plants and wreaths at the lively Brixton Farmers Market every Sunday. Why not drop in if you're in the area? I sell bespoke, made to order seasonal wreaths and other floral arrangements. I love to help with special requests for funeral and memorial flowers or wreaths, using materials relevant to the family or loved one.